Cloud services have a rosy future, but a long build-out industry cycle is expected as businesses are slow to adopt and accept virtual datacenters. This theme, along with a detailed view of what’s driving cloud computing adoption, comes from a survey that was released today at the GigaOM Structure conference in San Francisco. Presenting on behalf of the 30 survey collaborators, Michael Skok, General Partner, North Bridge Venture Partners, along with industry experts suggested a 67 percent CAGR (compound annual growth rate) for cloud services over the next five years as more companies move compute power to hybrid clouds. The 417 survey participants agreed: While the majority of respondents suggest that only 25 percent of their compute power is the cloud today, a full 75 percent of those polled expect two-thirds of their compute power to be in the cloud within the next five years. That will shift the workload of I.T. and reduce datacenter headcount. 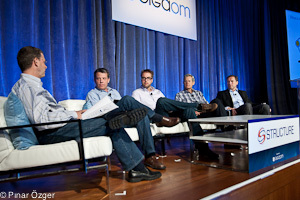 John Dillon, CEO of Engine Yard, pointed out that 80 percent of I.T. effort is currently spent on maintaining existing systems, which reduces the speed of change needed in today’s fast-moving environment. In terms of quick scale, “the cloud enables speed without requiring an I.T. end-around,” Dillon said. That agility and scalability of cloud computing is currently driving adoption. Lew Moorman, Chief Strategy Officer and President of the Rackspace Cloud, provided a recent example. “Miller beer is constantly doing promotions in a way that an I.T. simply can’t respond to. They have to use the cloud to make it work.” Another similar situation pointed out was the 2010 merger of Continental and United Airlines. Upon the news, the two companies expected 3 million page views per hour; a scale problem that simply couldn’t be solved within the confines of a data center. That may be true, but open source won’t help determine if businesses will use public, private or hybrid clouds. Survey participants were evenly split among these three options in today’s world, but are leaning towards the hybrid model in the future. A full 60 percent of those using public or private clouds today anticipate moving to a hybrid model. To illustrate this “best of both worlds” approach, Marten Mickos, CEO of Eucalyptus Systems, highlighted Plinga, a Berlin, Germany, publisher of social games. “Plinga initially offers their games on Amazon Web Servers to provide nearly unlimited scale that a data center can’t match. Once traffic settles down and becomes more predictable, Plinga seamlessly moves the traffic to their internal cloud of servers.” Sounds like the survey respondents agree and that hybrid clouds of the future may be the best game in town. All I have to say is “Duh!!”. Nothing… NOTHING… could be more obvious. This is what I’ve been talking about even before the trend of cloud computing begun sprouting like popcorn. Its future will be based, done, and applied as hybrid. Through this way, you get the best of both worlds, specifically when it comes to security, platforms, and infrastructure benefits of public and private cloud computing.